How can a business model be scalable and unscalable at the same time? When I co-founded the online ebook platform PaperC back in 2008, I made an interesting discovery. Our idea, to build a digital platform for electronic textbooks, was very scalable because it was purely digital. On the other hand, we found it relatively difficult to scale the business until I fully understood the concept of business scalability. Ten years ago, "old business" dominated the ranking of the most valuable companies in terms of market capitalization with PetroChina on the top, followed by Exxon and General Electric. In early 2019, the most valuable companies in the world are all digital platforms such as Microsoft, Apple, Amazon, Alphabet and Facebook. Why did these companies become the most dominant players in the world in such a short time? The scalability of their businesses. Venture capitalists learned early on that scalability enables rapid growth and can potentially deliver the highest returns. A scalable business model grows sustainably with a rather steep curve and can even grow exponentially. What does business model scalability mean? People have very different ideas about what business model scalability actually means. Some think of expanding business to other regions or continents. Others think about replicability of the business model to other areas or product categories. Another aspect that is often mentioned is the reduction of operational costs in expanding production volume and customer base. Clustering all topics and factors that have an influence on scalability results in internal and external scalability. The internal scalability concerns the configuration of the business model design, the resources and partners. The external scalability addresses the business environment (e.g. customers, market and regulations). The BMI Scalability Matrix was created on the basis of these two dimensions. Internal scalability describes how capable the operations of the business model are to expand the customer base and sales in a short time and at low cost. External scalability describes how beneficial the business environment is to expand the customer base and increase sales. Which factors influence internal and external scalability? How can I improve my scalability when I design new business models? The most scalable models to date are digital platforms that leverage external resources e.g. cars and drivers (Uber), engineers and product designers (Local Motors), or software developers and phone manufacturers (Android). One reason why leveraging external resources is so powerful is that there are always more resources outside your company than inside. Another reason is that by using other producers and resources you’ll create less overhead costs (e.g. HR, book keeping, managerial structures) - not to mention the financial liquidity advantage. Digitization and automation are the biggest drivers for innovation and extremely important for scalability. As long as nobody invents a robot that can cut hair, a barbershop cannot be as scalable as a software company. Automation in manufacturing (e.g. Ford Model T) is the reason for economies of scale. Today, we see automation everywhere. Uber is using dynamic pricing: that’s why when you get out of a club at 3am, the price for a ride home is 2x or 3x the normal price. With AI, more and more tasks will be automated soon. So how can you leverage algorithms to automate decision making? Every business model designed to scale needs a virtuous cycle of growth – sometimes also referred to as flywheel. Amazon’s flywheel has been really successful, and constitutes a good model for internal scalability. When you design a new business, you should carefully develop positive feedback loops that improve and extend your offering and thus your customer base and revenues. This is especially true when we talk about multi-sided platforms – platforms that attract two types of customers such as hosts and guests (e.g. AirBnB). After you solve the – so called – chicken-and-egg problem, the value proposition for the guests improves the more hosts use the platform and submit flats to rent and vice-versa. But developing a virtuous cycle of growth is not only relevant for digital platforms. Back in 1957 the legendary Walt Disney was already very aware about all the positives feedback loops between Disney’s Films, Music, TV, Magazines, Books, Disneyland, and Merchandising. Walt Disney’s business model 1957 is an early example of positive loops built to grow the customer base and revenues. People have different values, needs, and personalities. When you talk to venture capitalists, and you ask “what is most important factor for the success of a business? The market, the business model, or the team?” They will most likely answer “the team.” The team is the most important resource of a new venture. Not everyone is suited for scaling a business. Some people feel pain when things are fast, uncertain, and overwhelming. Other people feel pain when things are moving slow and every time a decision must be made all opinions must be heard. Your team needs experienced people – before you enter the scaling phase –with the right mindset to scale and grow the business. Everybody wants to be in a big and growing market. But what if you have to decide between the two? Should you venture into a big or into a growing market? In the late 90s, the internet market was relatively small, even though it was an exponentially growing market. Business growth (e.g. revenues) and profitability were quite difficult to achieve for most startups at the time. Ten years later, the market was much more mature, and many startups grew more sustainably. A small market is fine, if it’s a niche market within a much bigger market. This is true, if your solution is flexible enough and thus more scalable to expand to a broader market (e.g. like Amazon starting with books, and then expanding to other industries). A growing market will help you spark vision and excitement and also makes it easier to raise funds. Your solution needs to fit the customers’ skillsets, habits, and lifestyles. Good customers in that sense are customers who are eager to adopt new solutions. You should target a market with a sufficient number of “early adopters” who are keen to try out new things. Ideally you can also leverage existing platforms to find the customers for business (e.g. AirBnB spreading on Craigslist or Instagram leveraging Facebook as an underlying platform). If you develop a two-sided platform that attracts producers (e.g. content creators on YouTube) and consumers (e.g. viewers on YouTube) it’s beneficial if your consumers on one side are able to become producers on the other side. This phenomenon is called “Side-Switching”, and can be a very powerful factor in growing your business. Another advantage is if your customers can also be your sales force. Companies such as Dropbox, Uber, or Hotmail were able to use their users as promoters of their service. You already know that you should target a big and growing market. But every market is somehow limited, through language barriers, geographical coverage, regulation, tolls and taxes, cultural differences, technological foundation, purchase power etc. Although Google’s search business is highly scalable, it is limited in its scalability reach. For instance, Google is blocked in China and it’s not available in many third world regions because of the lack of internet infrastructure. This is the reason why they started the Loon project, to bring internet to rural areas, where no internet is available today. How can you expand your market and overcome barriers and limitations? Companies that want to scale really big, need a higher purpose than making money or just growing market share. Salim Ismail, author of the book Exponential Organizations calls it Massive Transformative Purpose (MTP). A MTP is more than just a customer problem that you address. For example, Tesla’s MTP is “to accelerate the world’s transition to sustainable energy.” In the early phase of a business (before scaling) a higher purpose gives you direction and motivation even when things look dark. Later, in the scaling phase, a higher purpose helps align initiatives and attract a huge number of talents in a short period of time. Today, high potentials are more likely to join a company that has a real purpose and tries to solve a big challenge, compared to an organization without vision or ambition. 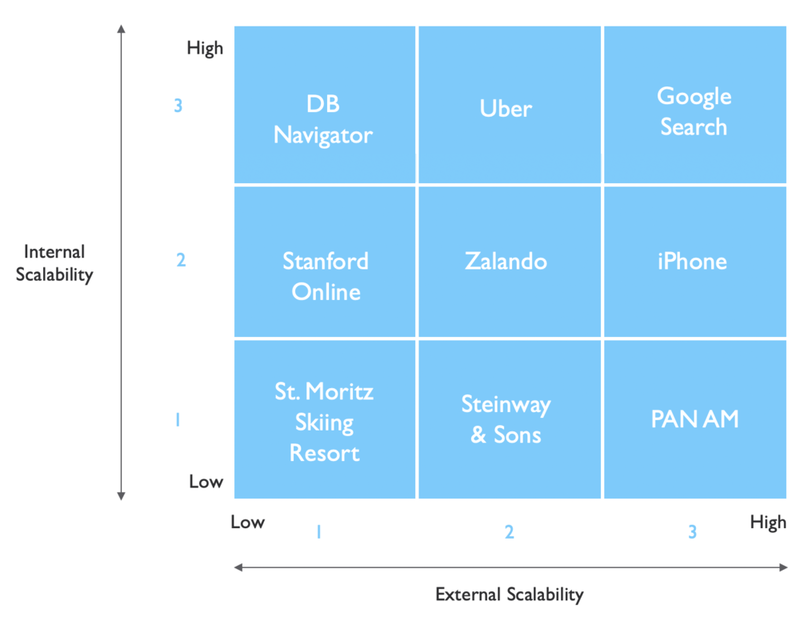 The BMI Scalability Matrix is a good way to assess your business model in terms of both internal and external scalability. We have crafted a classification to help you understand where your business is, depending on your scoring in both fields. When looking back at PaperC – the digital platform for textbooks, that I co-founded in 2008, the internal scalability was there. We used content from third parties (publishers) and delivered that to students and academics in a highly automated and digitized manner. On the other side, selling textbooks is a small market. Ebooks did not take off as impressively as; for instance, mp3 or online video did and the market was fragmented with different languages and local rights. The external scalability could not keep up with the internal scalability. It’s important to think of both sides of scalability – the internal and external side. If one side is weak, your growth potential is limited, no matter how good you are on the other side.